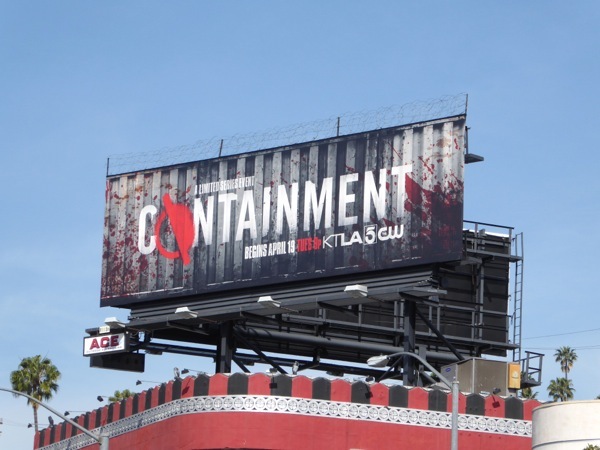 The CW certainly does love to tease a TV show, as this example for their new mini-series event, Containment, wonderfully illustrates. 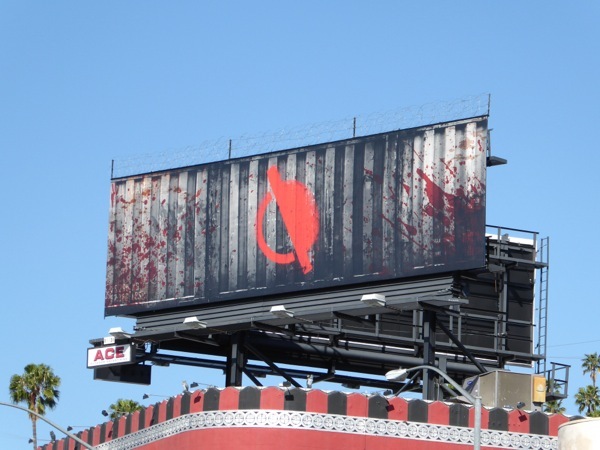 The viral outbreak drama is the latest import from overseas, based on the Belgian series 'Cordon', and sees a city quarantined when a deadly contagion hits the population, becoming a matter of national security. 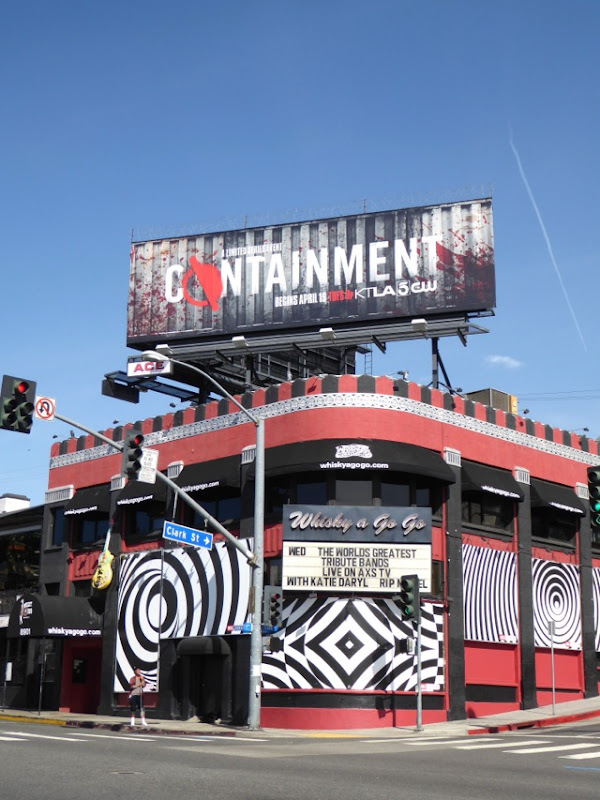 This special installation barbed wire teaser billboard, with just the red spray painted logo on the side of what resembles a metal shipping container, was first snapped above the Whisky A Go-Go club along the Sunset Strip on March 12, 2016. 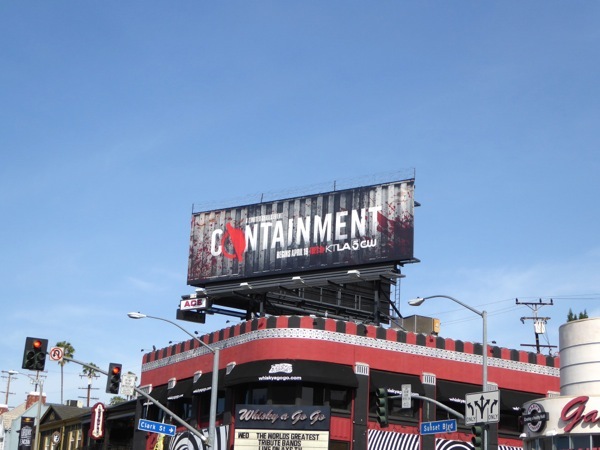 Meanwhile the follow-up version with the show's title, Containment, was spied in the same location on April 5, 2016. 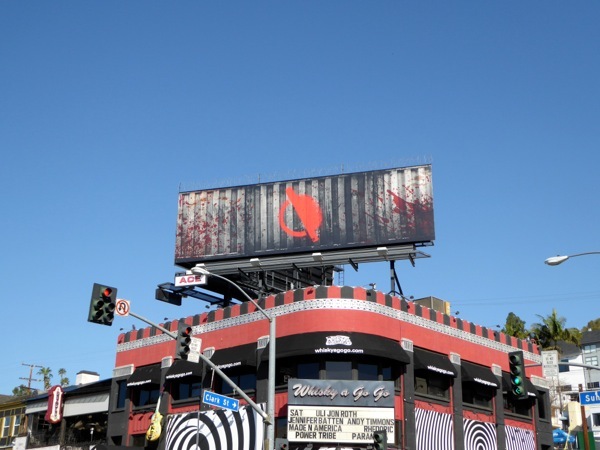 For other cool examples of special gimmick installations for other shows on The CW, be sure to also check out these Arrow 3D launch billboards and this season three billboard for The Vampire Diaries. 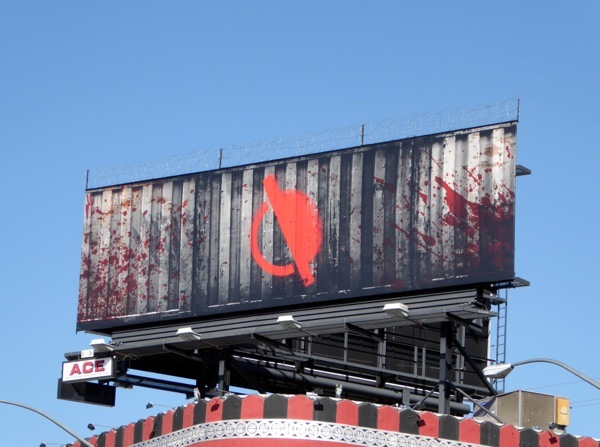 If you like this type of apocalyptic infectious sci-fi premise, you should also take a look at these movie billboards for Contagion from 2011, these TV billboards for The Strain from 2014 and these outdoor ad campaigns for The Last Ship from the past two years. 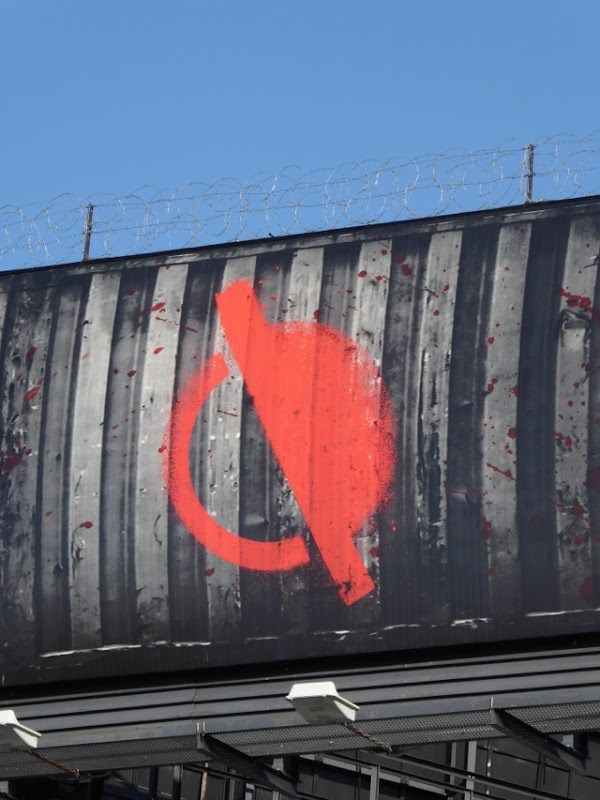 Obviously recent outbreaks like the Ebola and Zika viruses have shown that these threats do exist in real-life and may not just be the stuff of science fiction in the future. 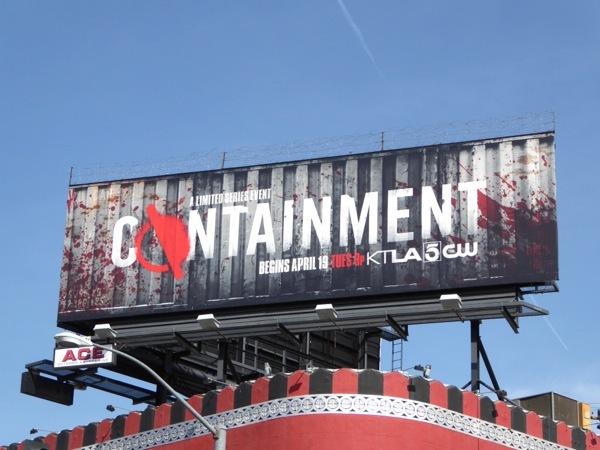 Will you be tuning in to watch this intriguing new limited series on April 19, 2016? 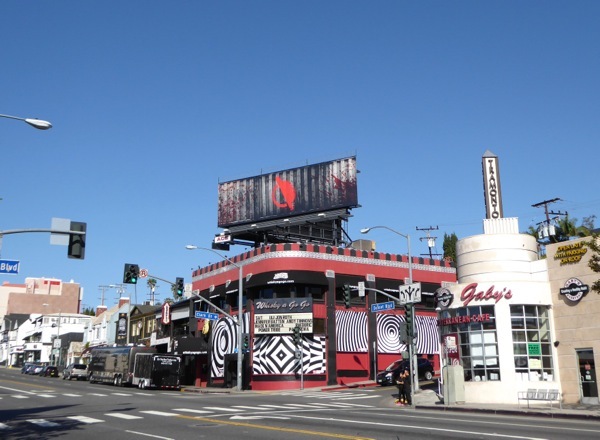 Missing it may prove fatal.